Indulge in this easy living spacious holiday house, set back and up from the waters edge, offering privacy and great views across the river. The main house deck spans the entire width of THE LOFT, and is a must as a dining location during your stay. 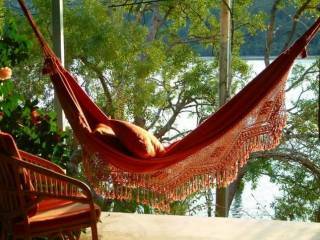 Curl up in the afternoon sun on the sun lounge or hammock. Inside curl up on the sofa next to the slow combustion wood fire. A screen w DVD player [ no TV ] , is located in the lounge. The well appointed kitchen is part of the open plan living/dining space. 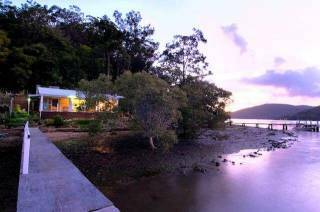 A gas barbeque is located on the deck overlooking the Hawkesbury River. The spacious master bedroom, with king bed, airconditioning and direct access to bathroom, also opens on to the main deck, with river views to the north east. There is a Second queen bed with separate access in the lower level wing. This is a great space with lounge area, dining nook and river views. There is also a bathroom on this level . Even if you are just 2 guests, this is the ideal spot to relax on those balmy summer days. Bifold doors on both sides of this space allow for wonderful breezes to drift through. 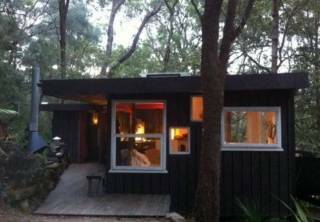 • take a walk into Muogamarra nature reserve just behind THE LOFT. • book a self drive hire boat, no license required ( they are easy to handle & do travel very slowly ) & explore the nearby river beaches, Bar Island , Pumpkin Creek & Spencer. Spencer Village Store & Cafe serving legendary breakfasts, brunch & light lunch. Truly the 'Hub of the Universe'. Also supplying a good range of meat, some vegetables & just about everything else you may need. Licensed Bottle Shop as well. Kitchen closes around 2.30pm Phone 4377 1123. About 10 km upriver by boat. Travel Approx. 15 km by Boat . Not suited to travel by self drive runabout. Check with restaurant regarding parking own boat at jetty. approx. $90.00 each way , advance return travel bookings essential. Parking & pick up at KANGAROO POINT public wharf, Brooklyn. Unrestricted parking on lower road. Book a return taxi transfer & 48 hour hireboat package for $320.00 , inclusive taxi transfers & hire boat with tank of fuel, life jackets, map & basic 'how to drive' instructions. Your boat will be at THE LOFT jetty waiting and you will travel upriver in comfort in the water taxi with your belongings . Additional hire at $50.00 per 24hours. Bookings well in advance essential as only limited number of hire boats available. up to 25' suitable. Private pontoon. Launch at Mooney Mooney ramp or at Dolphin Marina, 1 Brooklyn Rd ...A small fee applies. Some guests enjoy the longer & very scenic boat journey from Apple Tree Bay or Akuna Bay in Cowan Creek.